The world as we know it? Man, it is long gone at this point. Who says that anymore? But we’re not the ad copy police. (They won’t let us carry handcuffs!) So let’s look at this Stonehenge replica. We think it’s a pretty good trilithon. You can see other shots of it here and here. Score: 7½ druids. Good lichens, but it is just a trilithon. So you may ask, why does Doctor Who get to film at the real Stonehenge while this film didn’t? Well, people, that’s why they call him The Doctor, innit? It helps to be a beloved national institution! 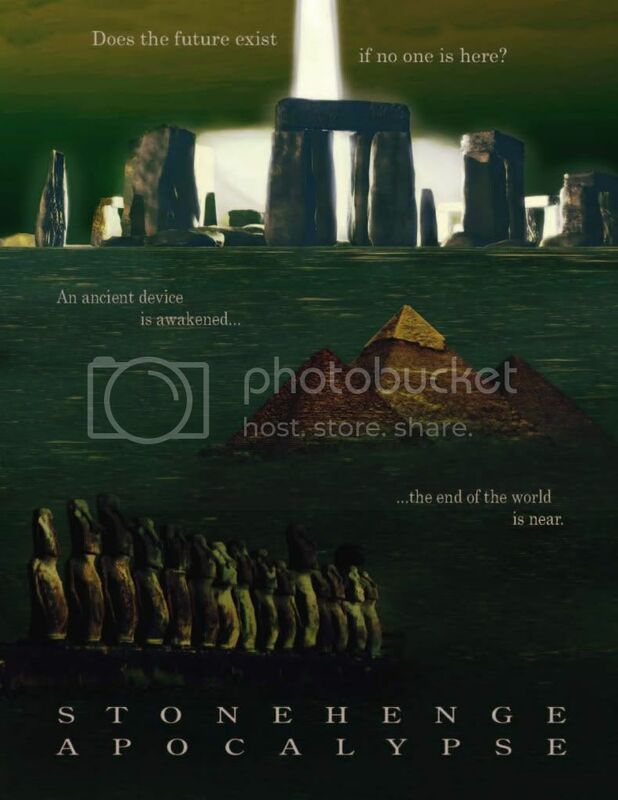 Meanwhile, here’s a synopsis of Stonehenge Apocalypse from the New York Times: “Stonehenge mystically begins rearranging itself causing massive unexplained natural destruction around the world.” No one seems to know just when it will air, but when it does we doubt it will reach Doctor Who audience levels. But we would love it if it surprised us. Any movie with a Stonehenge replica is one we’d watch! “The ancient DRUIDS did it with stone, the Michigan DRUIDS do it with snow.” So says the Snowhenge blog from which this picture came. We distinguish it from the blog of friend-of-Clonehenge David Mantripp at snowhenge dot net, who took the photo that marked our first posted snowhenge. We’ve done several snowhenges since then and we’ve seen many more that never made it to our pages, but most of them have been from places exotic, mainly Antarctica (here’s another, and another), where the Stonehenge-building field is strong and mankind cannot resist its power, and the even more exotic Bristol! 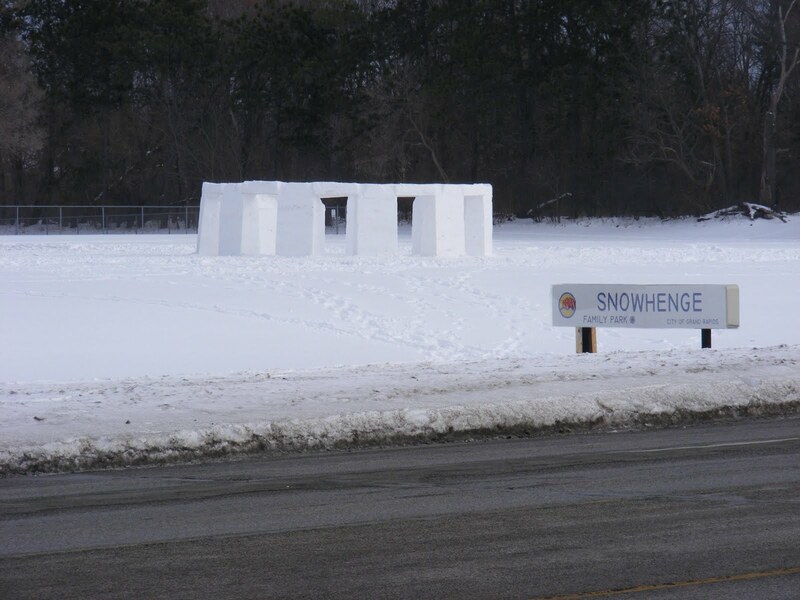 This time our outstanding snowhenge is/was in humble Michigan. Yes, Michigan is once more pushing to reclaim its briefly-held title of the Stonehenge State, after having it cruelly ripped from its claws by Washington State which no doubt wanted a name that people wouldn’t mistake for the national capital. To recap in case you’ve forgotten, Michigan is home to the little replica at Raven Hill Discovery Center, the all-over-the-web famous Wally Wallington’s Forgotten Technology henge (did he ever finish that thing? ), and best of all, the beautiful Nunica Henge, in our opinion one of the finest ever made. Bravo, Michigan! But if that should happen, we would definitely add this henge to our list of large permanent replicas. It wouldn’t tie Michigan with Washington State, but it would certainly put them in striking distance! Permafrost would be a small price to pay for a chance at the title! Score: Well, our snowhenge scores have been all over the place so far, but we’ll give this one a solid 8 druids. Why, if there’s no bluestone circle, no trilithon horseshoe, no ditch and bank?! It’s their prose, I’m afraid. Stupid silliness, as some have experienced, is the way to our hearts and our carefully-meted-out druids. And look at their closing line: “No matter the medium, the DRUIDS purpose remains the same – do it bigger, live it larger, play it harder, have some fun.” Hard to argue with that! Our thanks to the illustrious Andy Burnham of the Megalithic Portal, who sent this our way, and to Peter Salisbury who gave the permissions. Happy henging! A quick posting of a few more movies with Stonehenge connections, starting with the rather amusing one in the 2004 movie King Arthur with Clive Owen and, the reason a lot of people went to see it, Keira Knightley as a rather scantily clad warrior maid. At the end of the movie they get married at a construction that a lot of people think is Stonehenge, although it is by the sea near Tintagel in Cornwall, some way from the real Stonehenge in Wiltshire. It is a nonexistent Stonehenge-ish thing made for the movie. Some video-ish shots of it can be seen here. Another fun one is a less-known film called Merlin: The Return for which a Stonehenge replica was reportedly built in Africa where it was filmed. Alas, we have no picture of that one, but we’ve read that it situated Stonehenge in the woods, much as in this montage: Stonehenge as a Woodland Site. Less fun and not actually involving Stonehenge replicas were the Tess movies over the years, various versions of the Thomas Hardy novel Tess of the D’Urbervilles. A scene in the novel takes place at Stonehenge and some have filmed at the site. That includes the 2008 version made by BBC television and the 1979 version made by the infamous Roman Polanski with Nastassia Kinski in the lead role. And last, and for a change also least, we may as well mention the movie Halloween III: Season of the Witch. Why? “Silver Shamrock, a mass-producer of Halloween masks, plan to kill millions of innocent people worldwide by placing pieces of a stolen boulder from Stonehenge into small tags and attaching them to the masks.” And from another webpage we learn why: “See, Stonehenge was a sacrificial altar and wields enormous power, that will make their heads explode and burst forth with crickets and snakes.” How cool is that!? Eventually people do die, but we think they turn out to be robots or something. But there may be more–we confess we haven’t seen it. We just found the concept of destroying people using bits of Stonehenge as somehow amusing. Who comes up with this stuff? Well, there are some more Stonehenge-related movies for you. We have at least one more to mention and we’ll get to that after an unrelated post or two. If you know of some we may have missed, please post a comment or email us at the email in the side bar. What a Stonehenge world this is!